The Subversion team released version 1.5 recently, with some really tight features such as changelist and merge tracking. In our shop we standardized on Debian, and it's very likely going to take till 5.0 (lenny) until we get access. Normally I would just do a compile from source, but since this will have to be done on multiple servers, I decided to backport subversion from Lenny to create a nice little .deb package. Here are my steps, (tested on just my machine, so please try at your own risk). We'll start off by creating a directory for this process. Next, download the source packages from the debian packages site.. They're on the right. The first file was patch with debian specific changes, we'll need to apply this patch to the source tree. We'll need to change some file permissions to make this work. Now we switch to the root user, because we need to install some dependencies. Switch back from root to your normal user. I've had some issues making creating the java hooks. To get around this, we'll need to disable them. Do this by opening the 'debian/rules' file and change the line that says 'ENABLE_JAVAHL' to no. For me this was on line 21. Now we can get started building the package. You would need the fakeroot and debhelper packages too, to do this. Hey sven, check this out: http://funroll-loops.info/ Many interesting Gentoo quotes, but this is my all time favorite: "I'm currently isntalling Gentoo from stage 1 on 300Mhz laptop with 128 megs of RAM. And the compilation is not an issue. That guy sounds like he plans to do all the compiling during the time he would normally be using the computer. Why not do like I did? I started the bootstrap when I was on my way to bed. In the morning, it was finished. Before I went to work, I emerged system. When I got back home, it was done. X and Fluxbox were both installed during the night, no problems there. I didn't lose any time compiling all that software." One tip: Instead of manually unpacking the .orig.gz and applying the patch(es), you can do dpkg-source -x <whatever>.dsc and it will be done for you. 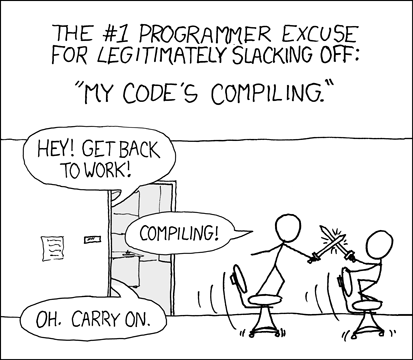 I love your "compiling" cartoon! Too funny! aaargh, make failed because it lacked *doxygen*! I've done almost exactly this (without java support, hence not on backports.org): http://people.debian.org/~dom/ - etch-backports repository there Feel free to use! Written by Evert Pot. Find me on Twitter or Github.